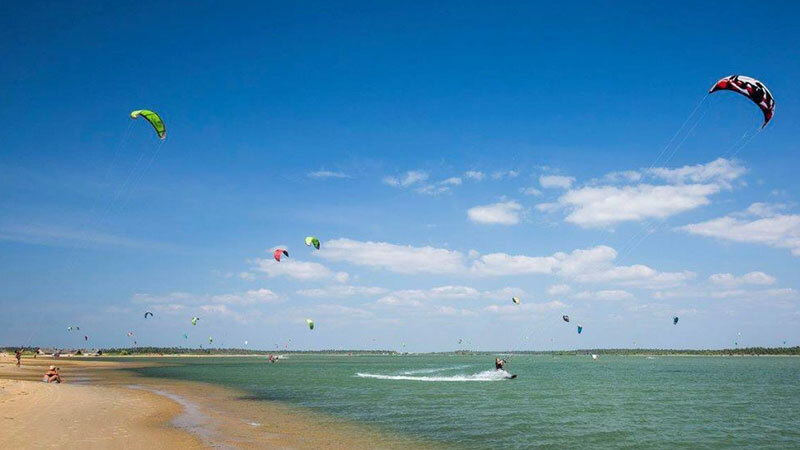 Kite surfing is a water sport which is famous in the coastal lines of Kalpitiya. Kite boarding (or kite surfing) is probably one of the coolest sports on the planet, hands down. No other activity combines the Zen of surfing with big air stunts and radical tricks that will leave you looking cool. This exhilarating sport combines different aspects of surfing, wakeboarding, and paragliding. Imagine being able to pull off all your favorite wakeboard moves without the assistance of a boat. While kite surfing, you can ride wherever you want with only the tranquil sound of the wind in your ears. Jump 30-feet off flat water without a ramp. Surf more waves in one day than you ever thought possible. Sri Lanka being an island surrounded by water makes it an ideal location for water sports. Take calm seas and add strong winds to that and you get the perfect combination of elements for Kite Surfing. you get this perfect combo off the western coasts of Kalpitiya and Mannar. You can experience Flatwater, Waves, Lagoon with wind averages of 18-20 knots during our Summer Season: May to October. In Winter Season December to March you can experience afternoon winds.